The Storm MadFlash Wiggle Wart has the original Wart's side-to-side "Wart" action but with colors and finishes that maximize flash. Features a Loud Rattle, External Scale Pattern, 3D Holographic Eyes, and #6 Premium Black Nickel VMC hooks. 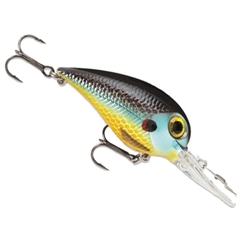 This Wiggle Wart has a body length of 2", 3/8oz weight, and 7-18 foot running depth.